The Badalisc (also Badalisk) is a mythical creature of the Val Camonica, in the southern central Alps. The Badalisc is represented today as a creature with a big head covered with a goat skin, two small horns, a huge mouth and glowing eyes. 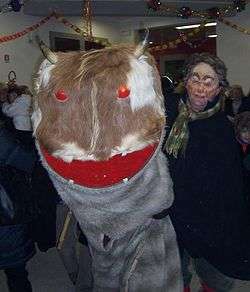 According to legend the Badalisc lives in the woods around the village of Andrista (commune of Cevo) and is supposed to annoy the community: each year it is captured during the period of Epiphany (5 & 6 January) and led on a rope into the village by musicians and masked characters, including il giovane (the young man), il vecchio (the old man), la vecchia (the old woman) and the young signorina, who is "bait" for the animal's lust. There are also some old witches, who beat drums, and bearded shepherds, and a hunchback (un torvo gobetto) who has a "rustic duel" with the animal. Traditionally only men take part, although some are dressed as women. In ancient times women were prohibited from participating in the exhibition, or even to see or hear the Badalisc's Speech; if they did so they would be denied Holy Communion the following day. In the village square (formerly in a stable) the Badalisc's speech (la 'ntifunada) is read, in which the mythological animal gossips about the community. The Badalisc itself is a dumb creature, so the speech, nowadays written in rhyme, is read by an "interpreter". Once improvised, now written in advance, the speech reveals all the supposed sins and scheming of the community. During the speech the hunchback bangs his stick rhythmically at intervals. The speech is followed by singing, dancing and feasting. In the evening the community eats the "Badalisc polenta" (a commercial version of this traditional food was launched in 2010). Until recently, village children would beg from house to house during the Badalisc celebrations for cornmeal to make the polenta; a Badalisc salami was also specially made for them. The badalisc has a place of honour at the feasts. On the second day, at the end of the exhibition, the Badalisc is set free and allowed to return to the woods. The ritual has strong similarities with the Bosinada, Bosinade or Businade, satirical performances of prose, poetry or song, in which a storyteller (the Bosin) denounced the misdeeds of the community. Known from the 16th century, these were once widespread throughout northern Italy and derived from the purification rituals of New Year's Eve. Any link between the Badalisk of Andrista and the mythical Basilisk (half lizard, half serpent, with a head like a cat, but squarer, like a toad) that incinerates everything on which it rests its gaze (well known in Cevo and elsewhere in northern Italy) is unclear. People listening to the "Badalisc's speech"
Wikimedia Commons has media related to Badalisc. ↑ "Festa del Badalisc ad Andrista (località di Cevo)" (in Italian). Retrieved 2011-01-03.